Lines are long and open gas stations are few and far between in New York and New Jersey, as drivers wait to fill up their tanks. NBC's Katy Tur reports. 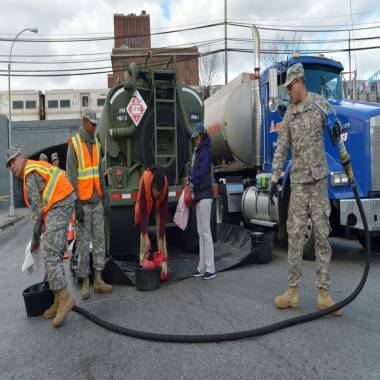 National Guard troops dispense gasoline in Queens on Saturday. The gasoline shortage in the New York City area should be over in "a couple more days," Mayor Michael Bloomberg said Saturday, urging New Yorkers to be patient even as officials promised free gas only to then add this caveat: first responders first, then the public can line up. Electrical power and deliveries are coming back online, Bloomberg said at a press conference, but even so "it may take a few more days before you see this additional supply." Earlier Saturday, New York Gov. Andrew Cuomo announced that "fuel is on the way" with the Department of Defense deploying five mobile fuel stations to New York City and Long Island, albeit with a 10 gallon limit. "The good news," Cuomo said of the promised 12 million gallons, "is it's going to be free." At least 1,000 drivers queued up at one site -- the Freeport Armory in Long Island -- only to be told the gasoline would not arrive for at least eight hours more, one driver said. "There's just so many people getting very frustrated. People don't know what to do,'' said Lauren Popkoff, a teacher who had been in line for four hours. The mobile station that opened in Queens was also swamped, NBCNewYork.com reported, with a line of cars stretching 20 blocks. But the state Division of Military and Naval Affairs later issued an advisory asking the public to stay away from the mobile stations until more fuel is released. National Guard Col. Richard Goldenberg said Saturday afternoon that people who were already at the distribution sites would not be turned away. Cuomo added that the reopening of New York Harbor has provided 8 million gallons of fuel and another 28 million will be delivered over the next two days. Tempers flared as people camped out all night, waiting for their turn at the pump in the wake of Superstorm Sandy. NBC's Tom Costello reports. A third of the stations in New York City were closed Saturday due to power outages or lack of fuel -- a significant improvement from Friday when two thirds were closed. When word of free gas spread Saturday, people rushed to the mobile stations. "I left my coffee on the table and ran out," said Tatiana Gomez of Staten Island, who heard about it on the news while having breakfast. Her's was the sixth car in line but she still had to wait 2 1/2 hours for the delivery to arrive. National Guardsmen walked through the crowd, handing out water to those waiting. "I think since 9/11 we've pulled together as people," Robert Costantino said while in line. "Now, when there's a crisis, we pull together." Long lines also continued at regular gas stations. "It's pandemonium out here," said Chris Damon, who was waiting among hundreds, many honking their horns, at a Brooklyn station. "I feel like a victim of Hurricane Katrina. I never thought it could happen here in New York, but it's happened." Desperate drivers continued to flood north to Connecticut in hopes of finding fuel. Gas lines snaked down surburban side streets as state troopers and local police maintained order and directed the traffic choking U.S. Route 1 , the main artery that runs parallel to Interstate 95 along the coast from New York city to Boston. The backups were mostly confined to stations in Greenwich and Stamford, the first locations across the state line. Gas stations further up the line were operating with little or not waiting. The availability of fuel north of the city resulted largely because Connecticut dodged two major factors that crimped the flow of gasoline in New York and New Jersey. Many stations in New York City and New Jersey were without power and unable to pump gas. The closure of New York Harbor – to clear dangerous debris and check navigation buoys – delayed some tanker shipments. Most coastal Connecticut stations, by contrast, had power restored by Saturday and tanker deliveries to coastal Long Island sound gasoline terminals in Bridgeport and New Haven were largely uninterrupted. Tom Kloza, chief analyst at the Oil Price Information Service, told The Associated Press that drivers seem to fear that stations will be out of gas for a week or more. "There are some people who need it, but there are a lot of people who are panicking," Kloza said. "There's plenty of fuel. This will be over in days." In New Jersey, Gov. Chris Christie on Friday ordered gas rationing in 12 counties to begin on Saturday under an "odd-even" system in which motorists with license plates ending in odd numbers would be able to buy gas on odd-numbered days. Christie said Saturday that he hoped the restrictions would only last "a few days." 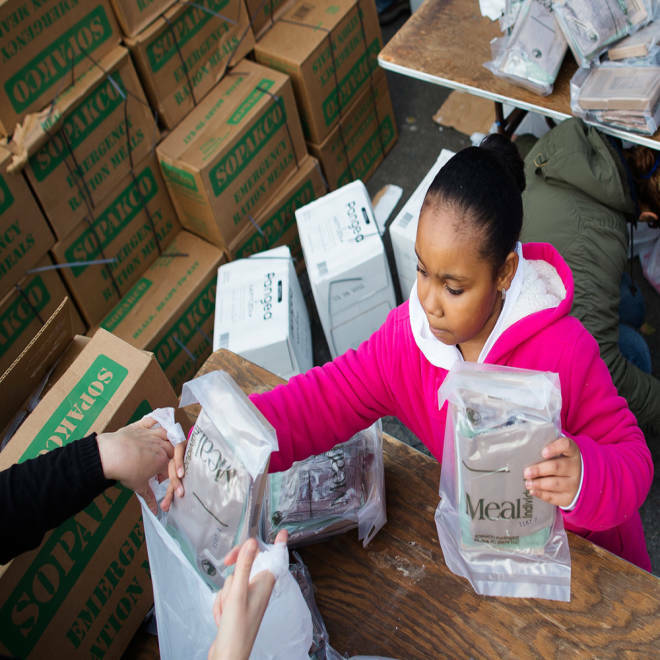 This article includes reporting by NBC News' John Schoen, Reuters and The Associated Press.